In general terms, the Romans coined the name 'Gaul' to describe the Celtic tribes of what is now central, northern and eastern France. 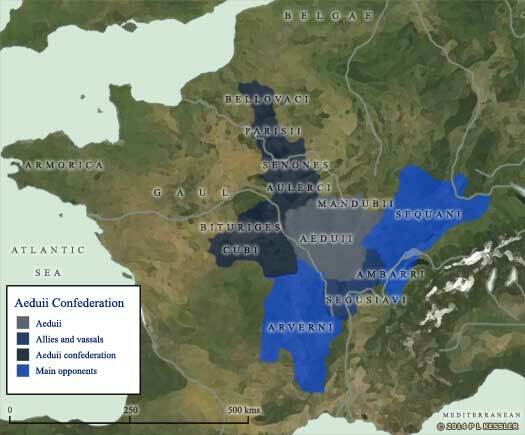 The Gauls were divided from the Belgae to the north by the Marne and the Seine, and from the Aquitani to the south by the River Garonne. By the middle of the first century BC, the Mandubii were a minor confederation that was located in Bourgogne (Burgundy) and the neighbouring Jura département in eastern central France. They were neighboured to the north by the Tricasses, to the east by the Lingones, to the south by the Aeduii, and across the Seine to the west by the Carnutes and a small pocket of the Boii. The Mandubii were a confederation of tribes, according to Julius Caesar, and a Celtic tribe must have a fancy name. A fancy name would have been essential if other tribes were to join. The first element was 'manos', meaning 'a hand', plus 'dubja', meaning 'black'. The confederation was 'the black hand'. The confederation is mentioned only by Caesar in his Gallic Wars, and by Strabo when referring to the same topic. 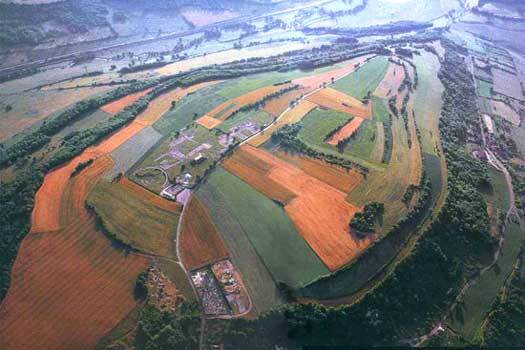 It occupied an area of modern Burgundy and the Jura, with an oppidum at Alesia, scene of the heroic last stand by Vercingetorix and his Gaulish allies in 52 BC. The Mandubii were largely wiped out by this conflict and no further mention was made of them. If any of them survived, the confederation certainly did not, so it may have been absorbed by neighbouring tribes - most especially by the Aeduii. It is even possible that the confederation was nothing more than an error by Caesar, perhaps misunderstanding how this particular group was related to other Gauls. By the beginning of the first century BC, and perhaps for an indeterminate period before it, the Aeduii are at the head of a tribal confederation that also includes the Ambarri, Aulerci, Bellovaci, Bituriges Cubi, Brannovices, Mandubii, Parisii, Segusiavi, and Senones. Against this confederation in the contest for supremacy in Gaul are the Arverni, to its immediate south, and the Sequani to its east. While Caesar is tied down in Rome, the Gauls begin their revolt, resolving to die in freedom rather than be suppressed by the invaders. The Carnutes take the lead under Cotuatus and Conetodunus when they kill the Roman traders who have settled in Genabum. News of the event reaches the Arverni that morning, and Vercingetorix summons his people to arms. His cavalry subsequently routed in battle, he withdraws in good order to Alesia, a major fort belonging to the Mandubii. The remaining cavalry are dispatched back to their tribes to bring reinforcements. Caesar begins a siege of Alesia, aiming on starving out the inhabitants. Indeed, matters become so bad inside the fort that the Mandubian women and children are ejected (possibly in the hope that the Roman lines will part to let them pass), but Caesar effectively traps them in the no-man's-land between the opposing forces and allows them to starve. Four relief forces amounting to a considerable number of men and horses are assembled in the territory of the Aeduii by the council of the Gaulish nobility. Together they attempt to relieve Vercingetorix at Alesia, but the combined relief force is soundly repulsed by Julius Caesar's remarkable strategy of simultaneously conducting the siege of Alesia on one front whilst being besieged on the other. Seeing that all is lost, Vercingetorix surrenders to Caesar. The garrison is taken prisoner, as are the survivors from the relief army. They are either sold into slavery or given as booty to Caesar's legionaries, apart from the Aeduii and Arverni warriors who are released and pardoned in order to secure the allegiance of these important and powerful tribes.